Juicy, tender chicken quarters and fantastic tasting potatoes with fresh herbs and vegetables make this one dish meal an easy hit. When I first made this meal my husband announced that it was his favorite meal. Pre-heat oven to 350 degrees. Coat a large baking dish with cooking spray. In a large bowl, mix the potatoes, onion, mushrooms, garlic, 1 tablespoon oil, 1/2 tablespoon lemon juice, 2 tablespoons of rosemary, and 2 tablespoons of oregano. Place vegetables in the bottom of the prepared baking dish. 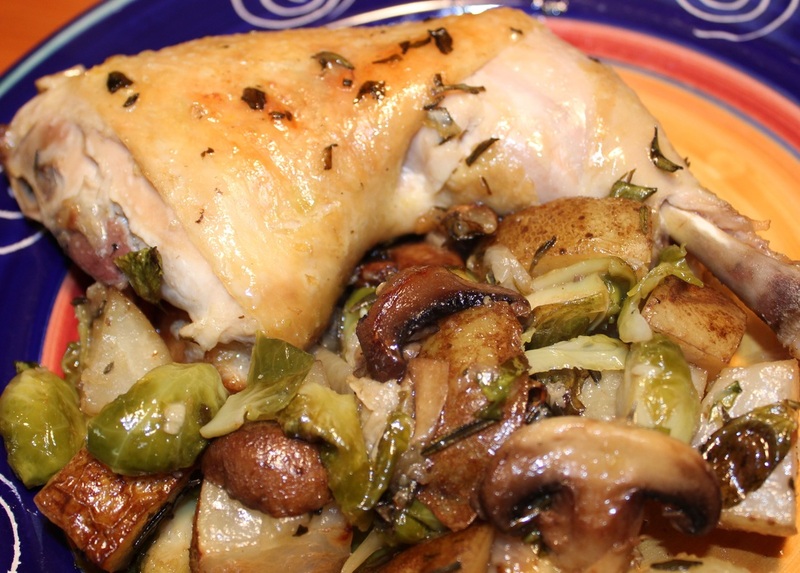 Place chicken in the large bowl and mix it with the remainder of oil, lemon juice, rosemary, and oregano. Arrange chicken skin side down in the baking dish on top of the vegetable mixture. Bake uncovered for 30 minutes, remove the baking dish from the oven, add the Brussels sprouts, stir well, turn chicken quarters over, and bake uncovered 30 more minutes.